Secretly, I love Monday nights this fall because I’m motivated to workout after work, unpack my lunch bag, make dinner and pack Tuesday’s lunch all 8pm when The Sing Off and Dancing with the Stars begin. It is during that time that I get my crafting in while listening to the shows and sometimes stopping to look up at certain dancers. 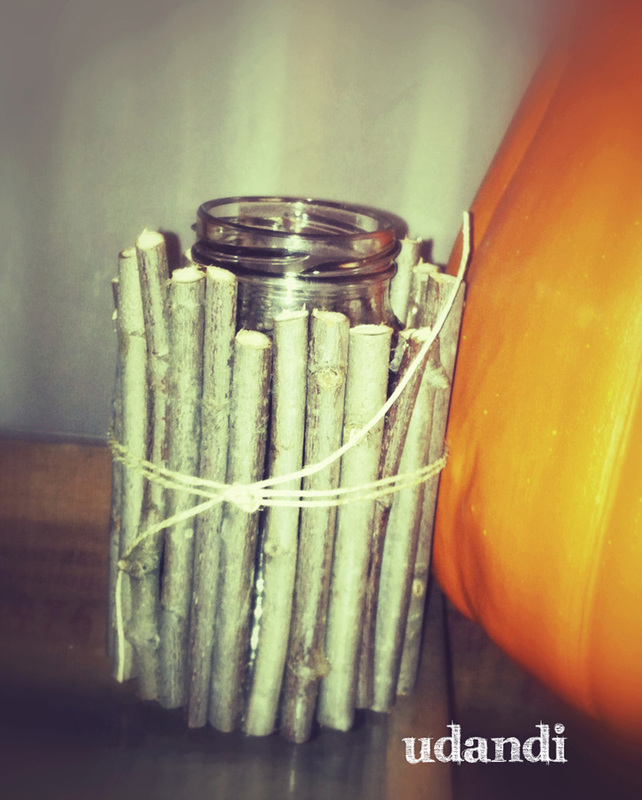 This past Monday, I should have gone outside to mulch my leaves but instead I brought in sticks, cut them, glued them around a glass jelly wrapped a string around it. The opening is big enough to drop in a LED flicking votive candle and since I never decorated my pumpkin for Halloween, I’m thinking of making another for a harvest, fall, Thanksgiving display.